Interphase: The phase between subsequent cell divisions is called the interphase. The interphase lasts for more than 95% of the cell cycle. 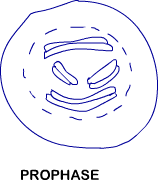 M Phase (Mitosis phase): The actual cell division takes place in the M phase. The M phase lasts for less than 5% of the cell cycle. The M phase is composed of two major steps, viz. karyokinesis and cytokinesis. Division of nucleus happens during karyokinesis. Division of cytoplasm happens during cytokinesis. G1 phase (Gap 1): During this phase, the cell is metabolically active and continuously grows. S phase (Synthesis): During this phase, DNA synthesis or replication takes place. The amount of DNA becomes double during this phase, but the number of chromosomes remains the same. G2 phase (Gap 2): During this phase, protein synthesis takes place. Condensation of chromosomal material takes place. A chromosome is seen to be composed of two chromatids. The chromatids are attached together at the centromere. Various cell organelles; like golgi bodies and ER cannot be seen during this staged. Nucleolus and nuclear envelope also disappear. All the chromosomes come to lie at the equator. In each chromosome, one chromatid is connected to the spindle fibre from one pole and another chromatid is connected to the spindle fibre from another pole. The plane of alignment of chromosomes during this phase is called metaphase plate. 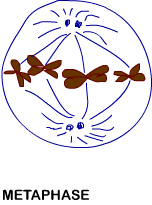 Centromeres split which results in separation of chromatids. After that, chromatids move to opposite poles. The chromosomes form clusters at opposite poles. They become inconspicuous. Nuclear envelope is formed around the chromosome clusters. Nucleolus, golgi complex and ER are also formed. Division of cytoplasm is achieved by cytokinesis. In animal cell, a furrow appears in the plasma membrane. The furrow gradually deepens and finally joins in the centre. Thus, the cytoplasm is divided into two parts. In plant cells, cell wall formation begins in the centre. This grows outwards to meet the existing lateral walls and thus, the cytoplasm is divided into two parts. Mitosis results in the formation of new cells which are required for growth and repair. Mitosis results in the formation of two daughter cells; which have identical genetic makeup, similar to the mother cell.